Click here to watch the entire episode. 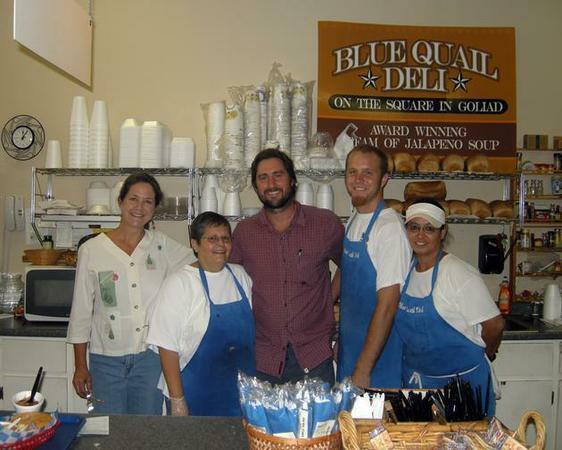 GOLIAD - Apparently actor Luke Wilson wanted cream of jalapeno soup on Thursday. Goliad residents spotted Wilson in the Blue Quail Deli here, and several posted his appearance on Facebook, ordering the restaurant's "famous soup," said owner Terry Baiamonte. "They came in fairly early and asked about famous soup," Baiamonte said. "Him and two other men. I didn't know who they were. I asked him where he was from and he said, 'Austin.' They ordered soup to go." Baiamonte said she didn't think much about the visitors until about seven or eight women were standing around him getting their photograph taken. County extension agent Brian Yanta was also there at the time and posted to Facebook that he was "laughing it up with Luke Wilson at the Blue Quail Deli." The Blue Quail Deli, in Goliad, Texas, features great food and a casual relaxing atmosphere in which to eat. Soups (including our award winning Cream of Jalapeno soup), salads and deli sandwiches made with our fresh baked bread, are made fresh daily and served by our friendly "Blue Crew" staff. "We discovered this delightful café-with it’s metal wall sculpture of a blue quail and her three chicks-during a visit to nearby Presidio La Bahia. A grilled roast beef sandwich with provolone and a hot pastrami melt on rye were fine, but the real find was the jalapeno soup, a light, cheesy blend of creaminess and piquancy." Texas Monthly click on Reviews tab for more reviews and awards!! The Blue Quail Deli also caters in-house or at your location. Please call us at (361) 645-1600 and let us know what your needs are. We may be able to cater items that are not on the regular menu. Our “Blue Crew” staff will work with you to make your event the best it can be by providing quality food!! If you need a meeting place with food available please call us at (361) 645-1600. There are two different rooms available. Please visit our Meeting Rooms page for photos of the meeting rooms available.